This work is accompanied by the copy of a certificate issued by Viviane Grimminger and dated 16 May 2002. This beautiful early work by the Spanish sculptor Julio Gonzalez demonstrates the artist’s engagement with and understanding of form, space and movement and looks forward to his position as one of the greatest sculptors of the 20th century. 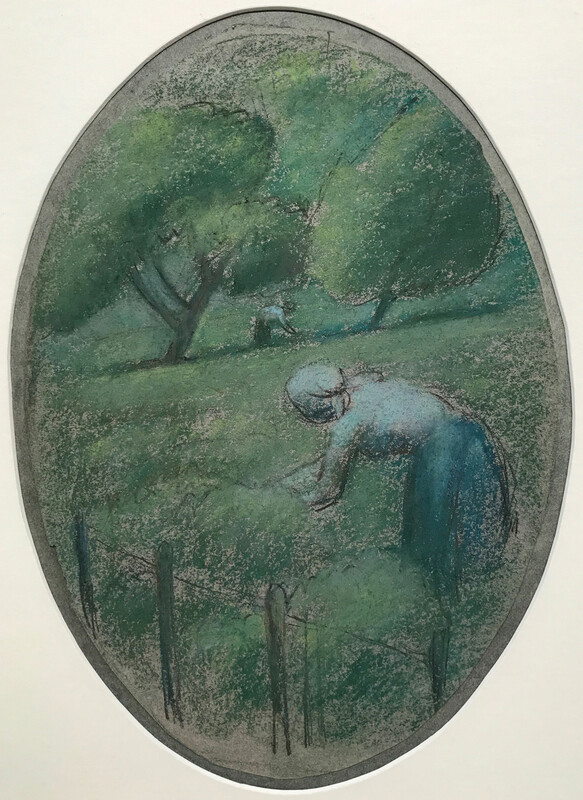 A highly accomplished draughtsman, Gonzalez’s early drawings depicted rural scenes and an earthy subject matter. Using a post-Impressionist style and palette, this drawing demonstrates a deep understanding of the teachings of Gaugin and of the human form and its physical presence, elements that would prove highly important for his later, radical experiments with abstraction. Gonzalez become close friends with Brancusi, when he was working in Paris, and with fellow Spaniard Picasso in the early part of the 20th century. In 1918, at the roughly the same time as this work was created, Gonzalez discovered welding and began gradually abstracting his work, a process that continued throughout the 1920s. His unique sculptural style incorporated distorted organic and metamorphic forms, expressed through line and space. The composition of this drawing anticipates this, with its dramatic horizon line and angular forms for the trees in contrast to the curve of the figures. Gonzalez developed this sculptural language concurrent with the Surrealist group and Abstraction-Création, and his work was highly influential on younger 20th century artists, most notably David Smith and Anthony Caro. His work is found in major collections worldwide including MoMA, The Pompidou Centre and the Tate Collection.